One of the most important things you can do when building a positive online reputation is secure one (or a few) personal domain names, i.e. yourname.com. In this guide, we’ll break down everything you need to know about selecting and purchasing the right domain name. Why should you buy a personal domain? Make your website more search engine friendly: The domain name indicates to search engines what the website is about and is a major factor when ranking search results for a specific search term. Many factors are in play, of course, but a website with the domain name “yourname.com” has a much better chance of ranking well when people look you up than if you used “awesomewebsite.com”. 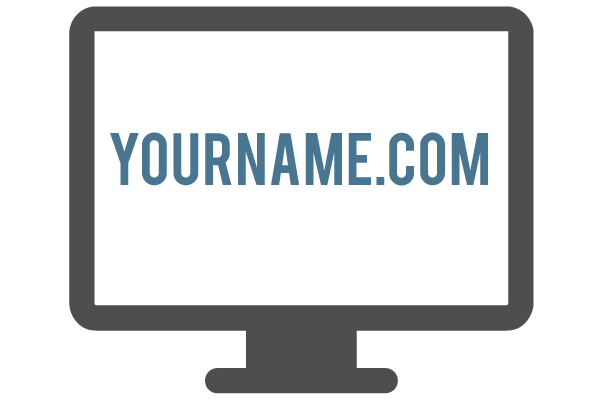 Apply a custom domain to a profile (like BrandYourself! ): If you’re not planning to build a website just yet or purchased several domains, applying a custom domain is an easy way to help a profile rank higher for your name. First, check that the website allows you to apply a domain to its profiles and then follow the site’s specific instructions for how to direct the domain to the profile (see below for how to add a custom domain to a BrandYourself profile). It prevents someone else from buying it: Whether you have a common name or want to prevent a vengeful competitor from snagging it out from under you (yes, we’ve seen it happen! ), purchasing a domain is always better done sooner rather than later. Even if you don’t plan to use it right away, it secures the domain from someone else purchasing it. You can buy a domain at any domain registrar. A few common ones include Hover.com, GoDaddy.com and BlueHost.com. Many registrars also offer a number of additional services like website building, hosting, email, etc. Do some research on which registrar fits your needs. If you’re just looking for the domain name, no need to purchase any add-ons. The cost for a domain can range vastly based on how common the name is, if a number of people have looked into purchasing it, or if it’s the name of a famous person/company/brand. However, you can typically purchase a personal domain for about $12-$20 per year. Many registrars will also offer a discount if you buy a number of domain names at once and/or register the domain(s) for multiple years. What type of domain should I get? Get Your Full Name Together (or the name people will search for you): This is very important. Make sure to get a domain that contains your full name (ex: johnsmith.com NOT jsmith.com). If you’re having difficulty, you can add a middle initial but make sure that it is the term people will actually use to search for you. A good rule of thumb: use the full name that appears on your business card / in your email signature. Add a qualifying term, but never a hyphen: If you’re really struggling with finding a domain that contains your full name, you can add a qualifying term (ex: yournameonline.com) but do not add a hyphen (ex: your-name.com). When choosing the qualifying term, try to leverage other keywords. For example, if you’re a real estate agent in NY, you might want to check if “yournamerealestate.com” or “yournameny.com” is available. The important thing here is that your full name remains together. Shoot for the .com: When it comes to domain extensions, “.com” is still king. That being said, a number of domains rank just as well (given the site itself is search engine friendly). “.Net”, “.org.” and “.me” are all good ones to check out. Avoid new “trendy” extensions: You can now buy anything from “.pizza” to “.bingo”. As a general rule, stay clear. They haven’t been around long enough to know if they rank well or not and they definitely don’t have the same authority as a “.com” or “.net”. If you happen to own a pizza shop or consider yourself a bingo aficionado, you might decide to purchase one for laughs or to set up a smaller site, but don’t use it as your main domain. Purchase Immediately: If you go to a domain registrar and find the domain you want, purchase it ASAP. For one, it ensures that you have it and prevents someone else from buying it. It also prevents the registrar from purchasing it and tacking on extra fees. Some registrars will purchase a domain if they see someone take interest in it. The total cost of the domain will then be higher for the next person to purchase it. This doesn’t apply to every registrar, but it’s best practice to snag the domain you want right away. Register it for as long as possible: While it’s not as important of a factor as it used to be, registering a domain for a long period of time adds more authority to it. More importantly, it reduces the risk of your domain expiring before you renew. Most registers will also discount the cost per year if you register for several years upfront. Purchase as many as you like: Even if you purchase one domain, you might want to apply a second or third to another website or profile. For the purpose of a good online reputation management strategy, keep the domain consistent. For example, if you purchase “yourname.com“, also purchase “yourname.net“, “yourname.org“, etc. Don’t go crazy, you can’t buy em all: While it’s a good practice to purchase more than one, it’s virtually impossible to buy all the domains associated with your name. Stick with 2-3 domains and work to make the sites/profiles you put the domains on as search engine friendly as possible. Your domain name is just one part of your online reputation management strategy (albeit an important one): Buying a domain is just the first step to building a positive online reputation. Next, you need to build high quality websites and profiles, apply your newly purchased domains, and optimize them to rank as high as possible for your name. How can I add a custom domain to my BrandYourself profile? Change the name serves to ns1.brandyourself.com and ns2.brandyourself.com. If the registrar does not accept or offer a domain name system, use our IP address 50.116.56.61. We also offer step-by-step instructions for how to change the name servers for specific registrars right in your BrandYourself account. Once Steps 1 and 2 are complete, login in to your BrandYourself account to add the domain to your BrandYourself profile (remember, you must be a Premium member to apply a domain). Need more help with domains? Contact our support team at 646-863-8226 or support(at)brandyourself(dot)com. Bought caicopley.com and kaicopley.com, so in case people misspelled​ my name it I still get visitors. If your domain uses a less common spelling of a popular name, still purchase (if possible!) your name with the more common spelling variant(s), and redirect them to your main domain (that is, the domain with how you actually spell your name! ).